Why MIND THE GAP ? Did you know that the London underground system carries profound wisdom? All over it is written or announced; “MIND THE GAP”! 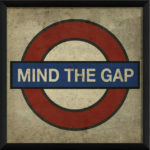 But the words that have been coming back to me are “Mind the gap”. The gap can be the silence between words, the space between in and out breath or the openness in pure presence…in the allowance to let life unfold before our eyes. In the underground system it is written to keep us from the danger of getting trapped in the gap. But in life itself, the GAP is the place to be, or to reconnect to. In the Gap magic happens, this is where pure potential is. When you have an idea of what you want in life, or a certain aim for your actions, it is easy to go into management mode of HOW to get there. Since I seem to be addicted to have a certain amount of uncertainty in my actions in life and art, I often have no choice but to let go of the HOW. To now live and create in Bali, gives me many opportunities to embrace THE GAP. Ups…not much here that reminds me of Christmas, so almost forgot to wish everyone a beautiful Christmas, with some GAP! Love from Ane in Bali.